Dataminers have been looking through the files of the latest update to Destiny 2, Update 2.1.4. 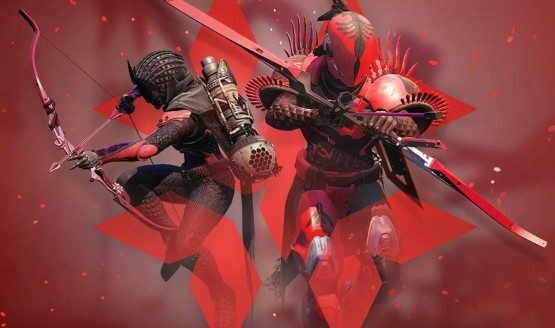 In these files they’ve uncovered details about the upcoming live event Crimson Days, and what it could be like when it goes live. The first image they found is the one at the top of this article. It’s likely to be the image that will be part of the popup we’re shown when we login after Crimson Days goes live. Notice the Bows these Guardians are using, they look pretty damn awesome and look to be something we can earn as part of the event. The Bow is called The Vow, and is a Solar elemental weapon. The flavour text, ‘Till death do us part’ is a brilliant touch on the weapon. The Vow’s stats seem to be pretty good, and it has a pretty spectacular perk, Archer’s Tempo, which decreases draw time with every precision hit. The Vow also has an Ornament that you can collet as part of the event, which just shows how much there is to Crimson Days this year. It’s said that Guardians will be able to purchase The Vow from Lord Shaxx, at a Power Level of 650. this is a pretty great time for any Guardians chasing the maximum Power Level to get a weapon set at it, helping them break into Black Armoury content and get ready for the enemies in Joker’s Wild. The Sugar Shell for your Ghost can be earned by completing the Crimson Days Triumphs throughout the event. Something called a ‘Crimson Bond’ can be formed with between you and another Guardian. This is done by completing Bounties together, and competing in the Crimson Days-specific Crucible playlist, previously known as Doubles. This bond rewards specific resources that can be used to buy Crimson Days items. Bungie already announced that in addition to new rewards for 2018 Guardians will be able to earn Crimson Days rewards from last year as well as part of this year’s event. Crimson Days has been pushed back so that it runs from the 12th of February to the 19th, giving us just a week to complete the Triumphs and earn all of the rewards we can. Finally, you don’t need to have the Annual Pass in order to access Crimson Days, it’s available for every Guardian with Destiny 2. Even the Forsaken expansion isn’t required to play. Let us know if you’re going to be taking part in Crimson Days in the comments.